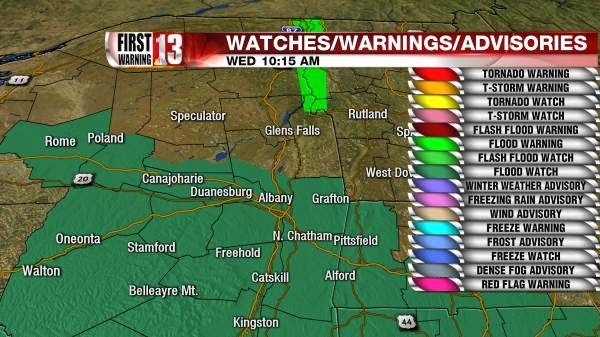 The National Weather Service in Albany announced earlier this morning that most of the Capital District - including the Schoharie Valley region - is in a flood watch due to a, "large slow moving low pressure system that will impact the area into Thursday resulting in widespread showers." Showers that are expected to bring anywhere from one and half to three inches of rain over the next day to the immediate area, with parts of the Eastern Catskills likely to see in excess of four inches. Minor flooding of rivers and streams is possible, with additional flooding of poor drainage, urban, and low lying areas likely with heavy rainfall. Residents in the aforementioned areas are cautioned to monitor later forecasts and be prepared to take action should flooding occur. We will keep everyone updated here at the Schoharie News as the storm develops.